What a beautiful day to cuddle up with a loved one, sit back, relax and enjoy the newest page of Team Stryker! Today’s page was a real fun experiment for me as it was the first time that I did really dramatic close ups of 3 characters. 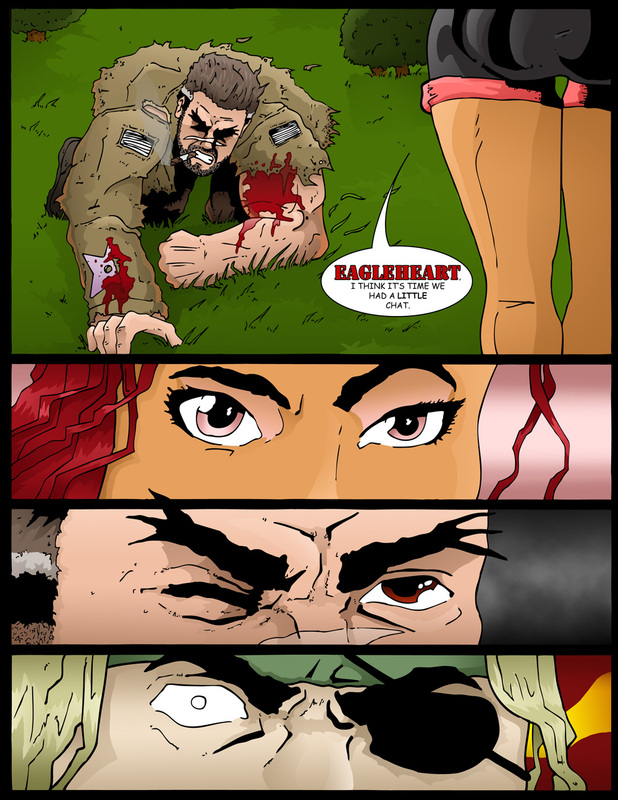 I tried to make it so that each person’s eyes told a totally different emotion: She-Cann is confident, Eagleheart is defeated and Deadeye is horrified. Deadeye is always in either a state of rage or extreme rage so his pupils are always dilated to the point where he has no eye color anymore. Drinking whiskey all day and not doesn’t help with his clarity either. While everyone is enjoying Mission 002 I’m hard at work on finishing coloring on Mission 003. There is a substantial jump in quality from Mission 002 to 003 as I switched from drawing on 8.5×11 pieces of paper to 11×17 comic board. It was a challenge drawing on such large paper but the results are worth it. I can’t wait to share Mission 003 with you, but before then we still have 9 more exciting pages of Mission 002 to get through! Have a great Thursday everyone and enjoy the weekend after that! I’ll see everyone back here on Monday with page 17 of Team Stryker Mission 002! Wow, I didn’t realize you did this in 8.5″x11″ paper. I can’t wait to see your jump to 11″x17″. If you get the first two isues in print I had to book them in “widescreen” so they scaled properly. If you think issues 1 and 2 look good wait until you hit Mission 003! My goal is to make sure that every new issue is the best issue ever!